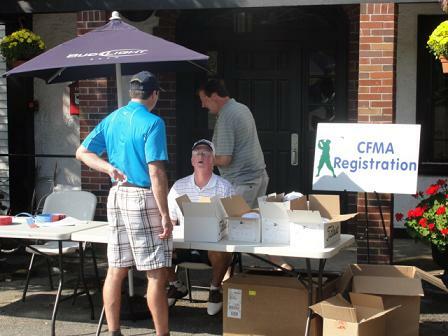 September 25th was another beautiful day as nearly 90 golfers teed off for the Annual CFMA of Massachusetts Golf Tournament. Just as golfers have enjoyed the links at Sandy Burr Country Club for the past 15 years, this year's participants were provided with wonderful weather, great conditions, fantastic food and entertainment as well as more material for some highly suspect stories. The Massachusetts Chapter established a scholarship fund for deserving students pursuing degrees in accounting, finance, architecture, engineering, and construction management. Just over 15 years ago this tournament was established to fund the scholarships. In the past 5 years $40,000 has been awarded students that will become the future leaders of our industry. Many thanks to this years’ participants and all of our great sponsors for making this such a wonderful event. 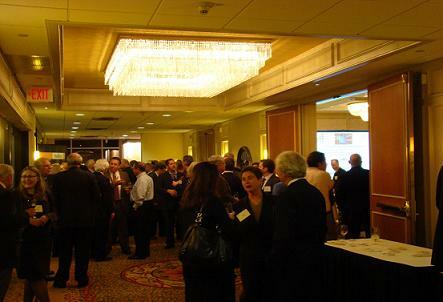 On April 3, 2012 the Massachusetts hosted a joint event with the Associated Subcontractors of Massachusetts at the Sheraton, in Needham. The two-phase event included a legal update presented by Michael Sams, Kenney & Sams, P.C., Carolyn Francisco, Corwin & Corwin LLP, and Bob Lizza, Hinckley, Allen & Snyder LLP, who covered topics from independent contractor employment relationships, MBE and WBE participation as it relates to the state Responsible Employer Ordinance, to current trends by government agencies to enforce compliance requirements on public construction projects. All of the presenters provided summaries of recently reported cases where contractors have been sanctioned, either civilly of criminally, for inappropriate practices and how to take steps to minimize these risks. Following the stimulating presentation and many questions the attendees adjourned for a networking session including meeting of new contacts, forming new relationships and, of course good food and drink. The next Chapter meeting will take place on May 1st which is the annual leadership presentation and the announcing of the annual scholarship winners. 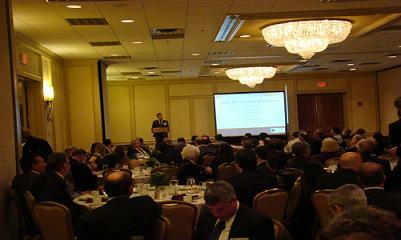 Over 150 individuals turned out for the annual CFMA/AGC, Massachusetts, Economic Summit on November 29th. 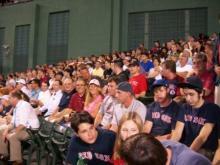 Joining in the event, this year, were members of the Associated Subcontactors of Massachusetts. Mr. Anirban Basu, CEO of Sage Policy Group, Inc., and economic and policy consulting firm in Maryland, was the keynote speaker. Mr. Basu is a highly sought, national, speaker on economics and has presented at the past two CFMA National Conferences. Special attention was given on the economy’s soft expansion and the impact of the global economy on our national, regional and local economics. Mr. Basu’s talk also encompassed the financial sector, labor, real estate and other relevant aspects of the economic climate. It was interesting, to the assembled group, to realize that as bad as the construction economy is in the chapter’s marketplace we, in New England, are less bad off than our counterparts in other parts of the country. The economic outlook may not be what we would like to hear but attendees left with a light step after taking in an economic presentation that was educational as well as entertaining. The very next day the market added over 500 points. Coincidence? These events would not be possible without our loyal sponsors. Mr. Basu has been a friend of CFMA for over four years and his presentations are always well received. In addition the Massachusetts Chapter is proud to have many members who continually offer the support necessary to provide the quality programming for which CFMA is known. 11/8/11 Can You Afford to Lose Your Best People? 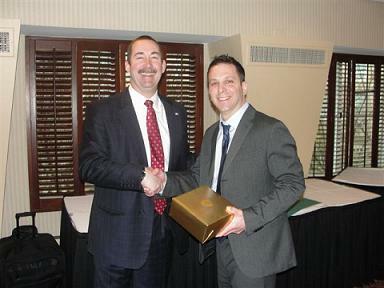 At the November breakfast meeting Justin Amico, CPA, Director of Construction Services Group at Feeley & Driscoll, P.C., took the Massachusetts Chapter through recent discussions around the importance of identifying and keeping key employees. Justin opened the program with data demonstrating that our economy is working its' way back from from the doldrums. Given this outlook it is time to, if we haven't already done it, to “Identify the Great People on Our Team and How to keep them part of our team”. Justin provided direction, proved by existing analysis, toward taking advantage of the coming growth by recognizing and creating the incentives required to keep those individuals that will take our companies into a successful future. Justin, a CCIFP designee, and Feeley & Driscoll are just an example of the regional professionals that provide the Chapter with continuing education and insight into our markets as our members strive to provide growth opportunities for their employees. 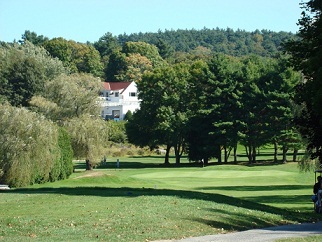 Birdies, eagles and other assorted wildlife looked down from a clear blue September sky as the Massachusetts Chapter of CFMA teed off for the annual scholarship tournament. Each year the chapter provides $10,000 in scholarships for college students pursuing degrees in accounting/finance, construction management or architecture/engineering. This tournament is the primary source of the scholarship funding. The day continued with a swapping of tales of heroics and amazing feats of golfing during the sponsored cocktail hour. Following was a buffet dinner and the awarding of prizes for golfing excellence as well as raffle gifts for those who really counted all of their shots. The chapter would like to thank all of the sponsors that made this year’s Scholarship Tournament such a great success. See you all next year. The May 10, 2011 meeting opened with the awarding of well deserved recognition to a CFMA member and the six recipients of this year’s scholarships. The William Schwab Award is presented to the CFMA of MA member who exhibits the passion and the leadership at the local chapter level that Bill had exhibited during his 17 years of service to CFMA nationally. This year’s award was presented to a member that upgraded the stature of our Chapter with his tireless work during his time on the board and as President. 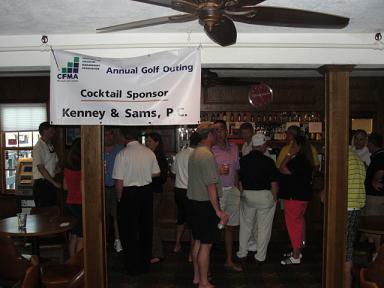 He has been a CFMA member since 2003. He played an instrumental role in shaping the scholarship policy that has helped construction professionals pursue their career. He enhanced the level of educational material provided to the membership, had record attendance for the programs run during his term as President, increased our membership to 189, and developed a succession plan for the Massachusetts Chapter to ensure that this Chapter continues to thrive in the future. This month’s program was the Leadership Journey presented by James O’Neil of Impact Skills, Inc. Leaders make a difference to those that they are exposed to. In order to be successful organizations must develop leaders who can meet the challenges of today’s ever changing marketplace. James took the group through the journey that he took to success.What does it mean to be a leader? How do you personally influence those around you? How can you be effective? Are all stops along the Leadership Journey. Through personal failures and successes we were provided with the insights necessary to succeed and insure that those around us succeed. James O’Neil consults, trains coaches and mentors, throughout the world on the topic of leadership. He currently leads Impact Skills, Inc., working with international. National and local firms to develop their workforces as well as obtaining training grants for over 130 companies since 2001. Stephen Melanson, of Melanson Consulting, taught a session on Verbal Branding to the Chapter at the April Breakfast meeting. Verbal Branding is a skill used by companies of all sizes that re-orients teams and whole organizations toward one simplified branding platform; a platform that moves beyond the selling application to simplify and improve the total company culture. The need for differentiation in today’s business environment is critical to success. If 95% of our competition does exactly what we do than we need to be very sure that we are capable of verbalizing the 5% that makes us different. Melanson took those in attendance through the thought provoking Verbal Branding Platform learning experience leaving all with take away ideas as to how their company can simplify their own brand while accomplishing much more beyond mere marketing initiatives. In addition to learning about Verbal Branding the Massachusetts Chapter recognized Joe Burkett for being elected National Chairman. 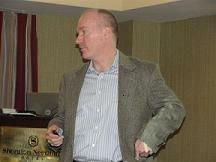 On May 5, 2010 we had the pleasure of hearing from Andrew Boynton, Dean of Carroll School of Management, Boston College. Boynton was a unique guest coming to us from outside of the construction industry to speak on ideas and implementation. Boynton’s resume prior to being Dean includes, professor of strategy at the world renowned Institute for Management Development (IMD) in Lausanne, Switzerland for 10 years, where he became a faculty leader in designing outstanding executive learning experiences and consulting with firms from around the globe. At the IMD he led a faculty team that created one of the world’s top ten Executive MBA programs, as recognized by Business Week magazine. Boynton began with this thought, “how do people find great ideas?” Ideas are what drive our firm’s success; Ideas come from what is going on in the world around you. Now introduce “the hunt”, the hunt for new ideas, “New and great ideas come from bits and pieces of old ideas.” Boynton supported his statements with multiple examples of Edison, Disney, and Warren Buffett, and how they took their ideas and turned them into success. Boynton’s advice on how can we take these examples and implement them into our everyday lives; we need to increase the likelihood of ideas surrounding us, position ourselves with great leaders, be interested, talk about the world around us, hang out with weird people-they are the source of great ideas - keep an open mind, store and keep your ideas. Boynton refers to the 3 keys to good ideas, interest, location and exercise…You must be interested, you must put yourself in the right locations, and you must exercise your ideas or they will never get better!Boynton closed with this, you must test your ideas, and if you fail early you will succeed sooner. The key to putting your ideas into play is communication and persuasion. And always LISTEN, conversation is how ideas move, people are the carriers of knowledge. Also at this meeting the annual William A. Schwab Award was presented to George Mastaby. George started with the Massachusetts chapter in 1988 and has been instrumental in getting it to where it is today. George was a past president and served two separate terms on the board when his leadership was needed. George is also still active in our golf tournament committee which is our major fundraising source for our annual scholarships. Finally, the chapter handed out $10,000 worth of scholarships to six deserving students who are pursuing their degrees in either accounting, finance, engineering, architecture or project management. Congratulations to all six. For more information on the scholarships and award winners please visit our scholarship page. Rich Gotham, Celtics Team President, spoke to the group on “Creating a Championship Team.” The presentation was followed by a reception and Promenade seats to the Celtics game. Gotham joined the Celtics after five years with the global internet media company, TerraLycos, where he served as vice president of US Sales and Corporate Development and was responsible for the generation of advertising, sponsorship, e-commerce, and business-to-business revenues. From April 2003 to June 2006, he served as executive vice president of Sales, Marketing and Corporate Development. 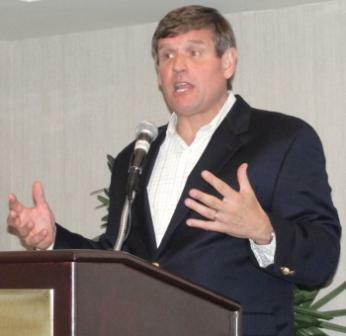 In June 2006, he was named chief operating officer of the Boston Celtics organization. In April 2007, Gotham was promoted to team president. In his new role, Gotham became responsible for all aspects of the Celtics business operations. In addition, he continues to work closely with Celtics Basketball Operations and the NBA on strategic initiatives and team-related matters. Gotham relates business to sports, because a winning team will sell more! Gotham joined the Celtics before they were a winning team. He understood that success on the court correlates to player payroll, so generating revenue was vital to replenishing team talent. Immediately, he recognized a need to create demand but he had a couple of problems. He had only four people on the phones driving sales and the head of sales was calling Boston, “a Red Sox town.” Gotham changed this by adding about 25 people to the sales group and by creating a corporate sales group to handle ticket sales to large corporations. He led the charge for the Celtics to become a familiar presence on every social network from Facebook to Twitter. Gotham and his team knew they had to deliver the right customer, to the right seat, on the right night, at the right price point. By adhering to this philosophy, they managed to exceed all previous game revenues. After the Celtics began to generate revenue and make the right decisions under the guidance of Rich Gotham, they added Kevin Garnett to the team. Gotham calls him the “difference maker” and with him on board, the organization dove into the huge task of controlling the fan experience. Each game soon became a show with choreographed music and video, dancers, hi-def screens and a dunking leprechaun. 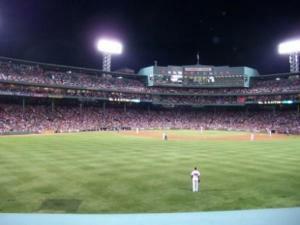 This resulted in keeping the fans happy while continuing to generate revenue for the team. 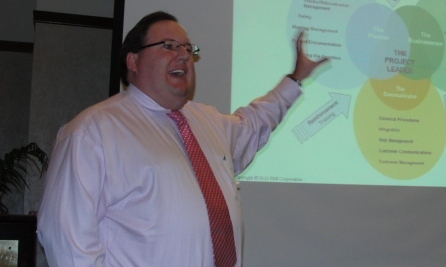 On March 4, 2010, Gregg Schoppman, Principal at FMI Corporation presented on the topic, "Turning your Project Managers into Business Managers." Schoppman specializes in productivity and project management and delivers his expertise in a way that engages the audience, and that morning we had a "full house." Schoppman began his presentation by asking the audience, "What are the traits of a great project manager?" Some qualities that were relayed by the audience included: good listeners, customer focused, trust-worthy, organized, and leaders. These examples were traits everyone in the room possessed. A key piece of advice provided by Schoppman was to call your customers on a regular basis, not only when something goes wrong. Call to let them know everything is running on time, the order came in, etc. Small touches like this one will change the mentality of the customer and will increase business in the long run. Schoppman emphasized that project managers are the key to the business. They are the eyes of the project from pre-construction to post-construction. One example that Schoppman provided was the comparison of Tom Brady and Bill Belichick to a project. This metaphor was used to drive home how important planning is. In an actual football game there are only 12 minutes of actual football played, compared to the countless hours of drafting plays, screening game film and running drills. Now, suppose you land a project Friday that's due to start on Monday. If you think you can plan a "quick meeting" and off load the plans Monday morning, you may as well be Bill Belichick sending Tom Brady out on the field the day of the game with a 3 ring binder and telling him, "good luck." The point of this comparison is that the most important part of a successful project is the pre-job planning. Additionally, once any project is completed there should be a debriefing meeting. -Plan: pre-job planning, budget, "real" perspective, clarify issues, know the customers needs. -Continue the Customer Relationship: keep them satisfied, meet performance measurements, SERVICE. -Manage the Project: Scheduling, progress meetings, be accountable for change orders, don't surprise the customer, bill on time, collect the money, and actively monitor the budgets. Schoppman closed out with this question to the audience, "Do you have project leaders or project witnesses?" Leaders do more than follow procedures. They make positive things happen and take charge. Tuesday 2/2/10 we had a breakfast seminar, graciously hosted by Zurich, North America’s largest construction insurer. Our presenters were John D. Miller, Vice President & Director of Subcontractor Default Insurance-Allied North America, and Stacey Lancaster, Senior Account Executive, Subguard-Zurich. John and Stacey gave an excellent presentation on “Understanding Subcontractor Default Insurance & its Prequalification Process”, key points that they touched upon were how to gather information on subs and suppliers(“character, capacity, and capital”) prior to buying out the project, what to do with the information, and to have set guidelines throughout the process. In addition to these informational requirements, they provided insight on proven techniques to aid in the areas of improving profits and customer satisfaction, reducing the frequency of defaults, and reducing the severity of defaults through up front activity.